The Overland Judith Wright Poetry Prize for New and Emerging Poets is made possible by the support of the Malcolm Robertson Foundation. Luke Fischer is the winner of the 2012 Overland Judith Wright Poetry Prize for New and Emerging Poets. 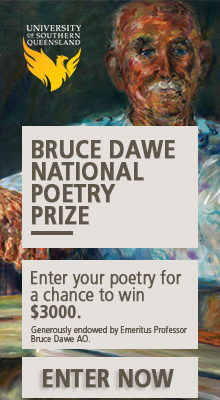 His poems have appeared in Antipodes, Cordite, ISLE, Mascara, Meanjin, Snorkel, and Newcastle Poetry Prize Anthology. He has held academic positions in the US and Germany, and in 2008 received a PhD in philosophy from the University of Sydney. He is currently completing his first collection of poems.